Treasure Hut Jewelry of Syracuse New York, located at 4461 E Genesee St.
Dewitt is proud to announce several services, including jewelry repair, watch repair, metal frame glasses repair and custom jewelry design. Owner Harry Stewart has more than 40 years of experience in jewelry repair and can fix almost anything — from cust om jewelry, to costume jewelry. “We can fix silver, gold, platinum and palladium. We can also repair grandma’s old costume jewelry,” he said. Since Mr. Stewart is extremely knowledgeable in repair, he also has an awareness and understanding of the best quality jewelry for his customers. “We avoid many popular lines of jewelry that are not functional because they break too easily,” he said. In addition to repair, Mr. Stewart also custom designs jewelry to fit the needs of his customers, especially for engagements and weddings. He said his process is simple for helping a customer design a diamond engagement ring and he enjoys helping customers pick out what is going to work for their bank account, as well as their personal tastes. “Jewelry is a gift of love. It’s not a gift of ostentation; it’s a gift of love. When we make jewelry and when we repair it, we understand that these are precious things from people’s families,” Mr. Stewart said. Treasure Hut can also create custom wedding jewelry accessories and gifts for wedding parties. Mr. Stewart’s extensive knowledge has allowed the business to offer two other diverse options for clients: Native American jewelry and watch repair. 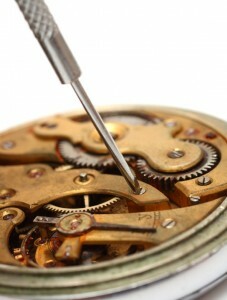 While Treasure Hut doesn’t make custom watches, they do specialize in watch repair and battery replacements. They also have one of the only employees in the Syracuse, New York area, who went to college specifically to become a watchmaker. For more information about Treasure Hut Jewelry, visit www.treasurehutjewelry.com.